You are into low fat meals. You wish to cook healthy meals. You are busy with work most days. You hardly have time for cooking. Cooking involves too much work. You have a small kitchen. Do these apply to you? With the right kitchen appliance, you can cook healthy low fat meals no matter how hectic your lifestyle. One such kitchen appliance is the hot air fryer for home use. The Tefal home hot air fryer was the first airfryer to be released in 2007 followed by the Philips air fryer in 2010. There are now a number of healthy hot air fryer brands in the market. I can bake, roast, fry and grill in my air frying machine. Now that’s neat, a hot air multi cooker that takes care of most of my meals for all occasions. Grilled sandwiches for breakfast, fish and fries for lunch, fried spring rolls for tea break and grilled salmon fillet for dinner is easy now. Warming up of leftover food just takes about 10 minutes and you can still get the crispy effect. The hot air multi cooker cuts out more than 50% of my cooking time. I get to attend to other chores while the food is cooking in the fryer. The machine takes care of all the hard work. There is hardly any mess to clean up after the meal is done. The air fryer parts are dishwasher safe. A quick wipe of the fryer main body is all that is necessary. The actual cooking time is fast with most food cooked within 15 – 30 minutes. Roasting a whole small chicken takes only 30 minutes. Most of the time I do not need to add any oil to my cooking. 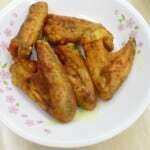 Chicken wings turn out superb; moist meat with crispy skin. Healthy delicious fried food with minimum oil is so appealing. I’ve found that heating up the fryer for about 3 minutes produce better results. This could be the same theory as using the Chinese wok or skillet. You heat up the wok before adding in the oil and meat. The high heat quickly seals in the meat juices resulting in more tender tasty meat. Spraying or brushing a very thin layer of oil produces a more crispy effect and a more golden color. Timing is important as this can make a difference between juicy and dry food. You need to experiment a bit to get the taste you love. The recipe book might not be so accurate. Turning the food ingredients halfway prevents sticking, more even cooking and browning. If using the Philips air fryer, shaking halfway is necessary for such items as fries. You have to make sure the bottom layer of fries are not stuck to the basket. Even for bigger slices of meat such as fish fillets, chicken wings or steaks, flipping them more than once prevents them from sticking to the mesh basket. This will also result in more even browning besides making the basket easier to clean later. Cooking wet battered food is a bit tricky. The rapidly moving air pushes the batter off the food and it gets plastered on the walls of the machine. However, if you pan fry it first so that the wet batter gets a bit cooked then transfer it to the fryer, you’ll end up with food that is crispy crunchy on the outside and moist inside. You get a deeper crunch compared to cooking without batter. Another way would be to coat the food in flour first, then in egg followed by breadcrumbs or cornflakes. Make sure the last step involves a dry ingredient. Cleaning up after every use is better as this makes it very easy to clean. A good soak in water is all that is needed. You don’t even have to soak in warm water. Hardened oil stains will need more effort to clean. 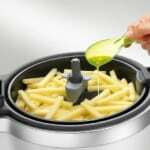 The home hot air food fryer is great for a kid’s party as you can easily cook the fries, nuggets with literally no sweat! You have more time to attend to the kids. The Tefal Actifry and Philips hot air fryer are mostly similar in their cooking method but there are differences. You can read all about the differences here. 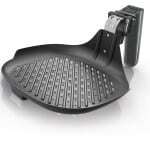 It is a good idea to get the Philips air fryer accessories if you’re using the Philips airfryer. These accessories will give you more cooking options. Cooking sweet as well as savory dishes and desserts are easier and more convenient with these accessories. 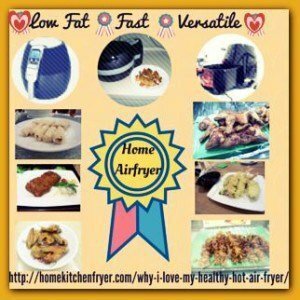 The home hot air food fryer is an amazing addition to your kitchen. Easy to use, easy to clean with a wide enough range of cooking options for most home cooks, you’ll be in the mood to cook healthy food no matter how busy you are or whatever your level of cooking skills. If you and your family eat at different times, then the hot air cooker is an excellent choice as it can easily cook or heat up a single portion real fast.